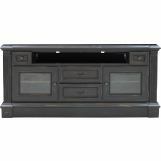 Bring a classic look into your entertainment space with the Fairbanks collection. Carved and moulded detailing throughout each piece and the antique vintage slate finish offer traditional style that you are sure to love. 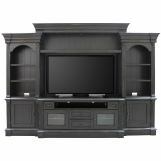 The 65" TV console is perfect for any space, while the four piece wall unit will help you make a statement. Antique-styled hardware adorns the door and drawer fronts. Fairbanks will add the charming style you've been searching for.